Journalistic malpractice is a term used to describe the once objective field of journalism which has now been reduced to ideology and slander. It is attributed to people within the mainstream media and old-media, but not exclusively. Their failure as a group willfully misleads, manipulates and distorts the public. Objective journalism was once the cornerstone of America's democracy. 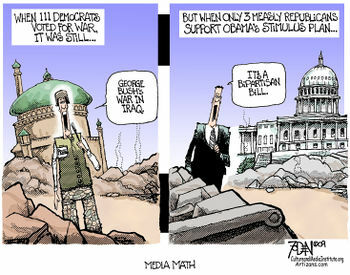 When objectivity is replaced with malpractice then the media loses credibility. Without credibility, journalism becomes error-filled, journalistic failure, reckless journalism, Gotcha! tabloid-like reporting, scaremongering or yellow journalism, outright factual inaccuracies, promotion of fact-free journalism or falsehood-spreading. One of journalists' corrupt goals is to manipulate or selectively edit statements to hide facts  or to perpetrate falsehoods  or hide unflattering stories of like-minded individuals. Another is to repeat falsehoods so that an issue dear to their agenda is kept alive in the public's mind. Another unethical tactic is to report "off the record" statements in a deception of the journalist's sources and interviewees. Most famously, Connie Chung interviewed Newt Gingrich's parents and solicited Gingrich's mother to repeat an insult he said in private about Hillary Clinton. Chung plied the information from Mrs. Gingrich with the lie: "Why don't you just whisper it to me? Just between you and me", falsely implying that she had no intent to repeat or broadcast the comment. ABC journalist damns whole field of journalism over “DANGEROUS” bias. Michael Malone writes, "...not just bewildering, but appalling." The mainstream media has chosen it side in the culture war. Traditional values, respect for others, impartial objective reporting has been made the enemy. Liberalism and all who support liberal causes are given high priority. Conservative causes are typically distorted by liberal journalists. Partial-birth abortion physician George Tiller is murdered, front page news in the New York Times. U.S. Military recruiter is murdered by a crazy Muslim terrorist attack, page 16 of the New York Times. Crimes against MSM supported issues (abortion) is newsworthy, Muslim terrorism is not a MSM supported issue. There were many instances of corruption within this elite group of journalists. Bush was scorned for golfing while U.S. troops were dying on the battlefield. Scorned again for giving up golf out of respect for U.S. troops. No such accusations from journalists against Barack Hussein Obama who has golfed more than 75 times in a little over two and half years in office. For a top 100 list of journalists presenting global warming alarmism, see the U.K.'s Numberswatch Warm List. Every imaginable absurdity from animals shrink to Yellow fever is the outcome of made-up science. Media malpractice from journalists does not care whether Sarah Palin is right or wrong, because facts and truth is irrelevant to the Mainstream media. The relevant point is that TV and print journalists incorrectly report what Sarah Palin says, instead focusing on "reporting" what they want their viewers or readers to believe she said. Journalists who are a part of the MSM machine routinely report incorrectly. In the case for Sarah Palin when she was the 2008 Vice Presidential nominee, widespread journalistic malpractice had a large effect on the outcome of the elections. On November 4th, 2008 millions of Americans were shocked that a man of Barack Obama's limited experience, extreme political positions and radical alliances could be elected President of the United States. For many of these Americans, the explanation was rather simple. The news media, completely enamored with Obama, simply refused to do their job. Due to media malpractice in America, the entity that Americans have depended upon so long to deliver honest, hard news can no longer be trusted. In response to the death of journalism, Bloggers, Fox News, Matt Drudge, and others took it upon themselves to fill the massive void left by a mainstream media that had abdicated their responsibility to inform the public in lieu of taking on an advocacy role for Barack Obama and leftwing causes. None of the three broadcast network aired a single story focused on whether President Obama’s economic policies were driving the U.S. towards European-style socialism. Not a single network news reporter used the term “socialist” to describe how Obama’s policies are shifting economic authority to the federal government, away from the free market. Network reporters never even called Obama or his agenda “liberal.” NBC and CBS never even used the word in reporting on Obama’s radical agenda. The mainstream media is in cover-up and counter-act mode. During the campaign, hardly a peep about Obama birth certificate lawsuits. After the election, coverage is also scarce. The few mentions of it have been dishonestly swept away, ridiculed as a nonconsequential matter. Enter the new catch phrase in the American lexicon, 'The Birthers' as coined by Politico. So now the media has made the issue into an internet 'conspiracy', it's a conservative rumor. Journalist will go as far as they can to cover for Obama. The Tea Party Movement represents a growing concern among the American people, great concerns for their country and for their families. Journalists from CNN and MSNBC mock the protests with sexual jokes, while at the same time neglecting to report on the movement with an unbiased point of view. ↑ Connie Chung interview with the Gingriches Warning: insulting word appears at end of interview transcript. ↑ Kyle Drennen. CBS: Sarah Palin ‘Launched an Offensive’ Against Media, NewsBusters, January 02, 2009. ↑ Media Malpractice Polling Research, Media Malpractice. ↑ Editorial by John Ziegler. John Ziegler's Exclusive Interview With Sarah Palin, The Sarah Palin "Media Malpractice" Interview, January 07, 2009. This page was last modified on 30 April 2014, at 11:10.